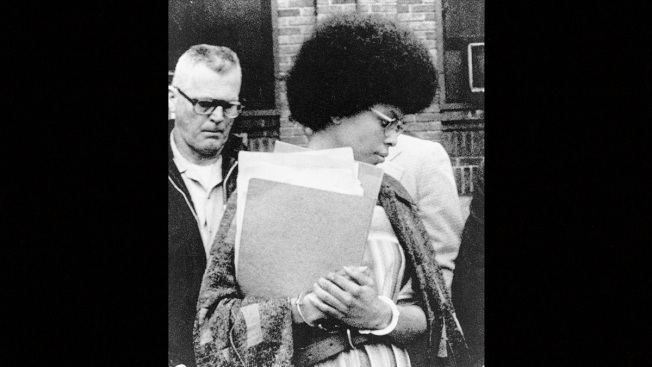 In this April 25, 1977 file photo, Joanne Chesimard, member of the Black Panther Party and Black Liberation Army, leaves Middlesex County courthouse in New Brunswick, N.J. The New York Post reports that JetBlue removed a poster honoring Chesimard at New York's Kennedy Airport after being alerted via Twitter that she is "a convicted cop killer." Now known as Assata Shakur, she escaped prison in 1979 and has been living in Cuba. JetBlue has taken down a poster of a convicted murderer that it had included as part of a Black History Month tribute at New York's Kennedy Airport. The airline said Saturday it removed the poster paying tribute to Assata Shakur last month after being alerted via Twitter that Shakur is "a convicted cop killer." "The intention was always to unite our crewmembers and customers around the importance of Black History Month and we apologize for any offense the poster may have caused," a JetBlue spokesman said in a statement. Shakur, also known as Joanne Chesimard, is a former member of the Black Liberation Army who was convicted of murder for her role in a 1973 shootout that resulted in the death of New Jersey State Trooper Werner Foerster. She escaped from prison in 1979 and is living in Cuba, where she was granted asylum. President Donald Trump demanded that Cuba return "the cop-killer Joanne Chesimard" in 2017 when he announced plans to reverse some Obama-era Cuba policies. The poster paying tribute to the now 71-year-old Shakur at the JetBlue terminal at Kennedy was first reported in the New York Post, which noted that one of the bullet points listing Shakur's accomplishments said, "Became the first woman to be placed on the FBI's Most Wanted list after escaping to Cuba from prison where she was serving a life sentence for the 1973 murder of a police officer." The poster also read, "Many people believe Shakur to be a political champion who is innocent of the criminal accusation against her." JetBlue said in its statement that the poster was part of a "ready-made batch of posters" that the airline bought from a third party.